So, after the success of their first entry, I was naturally very curious to see what Prolimatech had up their sleeve next. 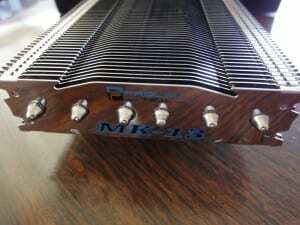 Enter the MK-13 VGA cooler, a massive cooler utilizing six 6mm heat-pipes, and a fairly universal mounting mechanism. 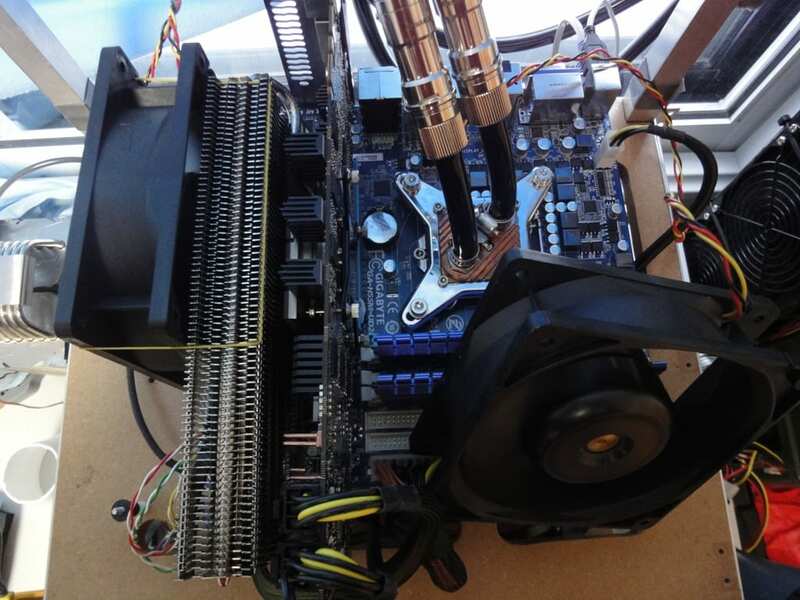 Does this cooler have what it takes to continue the legacy of its CPU mounted sibling? We shall see. Unpacking the cooler didn’t bring any surprises. Packaging was simple, safe, and secure. There are many ways to market and package a product like this. Some manufactures sell all parts a-la-carte, some stuff everything in the box with a mouse pad and a can of energy drink (joking). 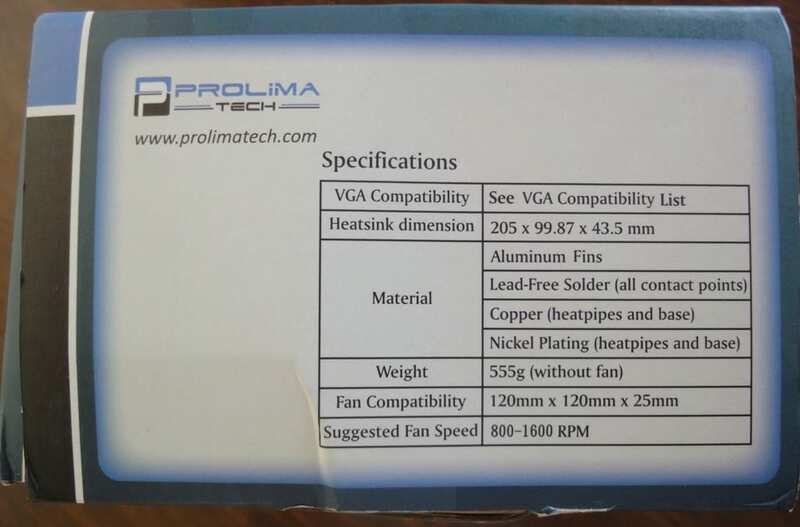 My preference is to get the cooler, and all the accessory heatsinks, but not the fan or any other unrelated manufacturer merchandise. I prefer to use my own choice in fan, and I think the majority of the enthusiast community would agree, one fan does not fit all, everyone has different priorities. So for me, this package is just about perfect, all the stuff I need, but none of the junk that would end up in my trash. 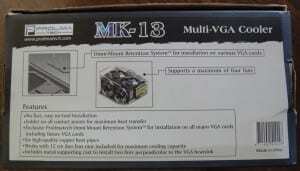 A few things disappointed me while assembling the card with the MK-13. 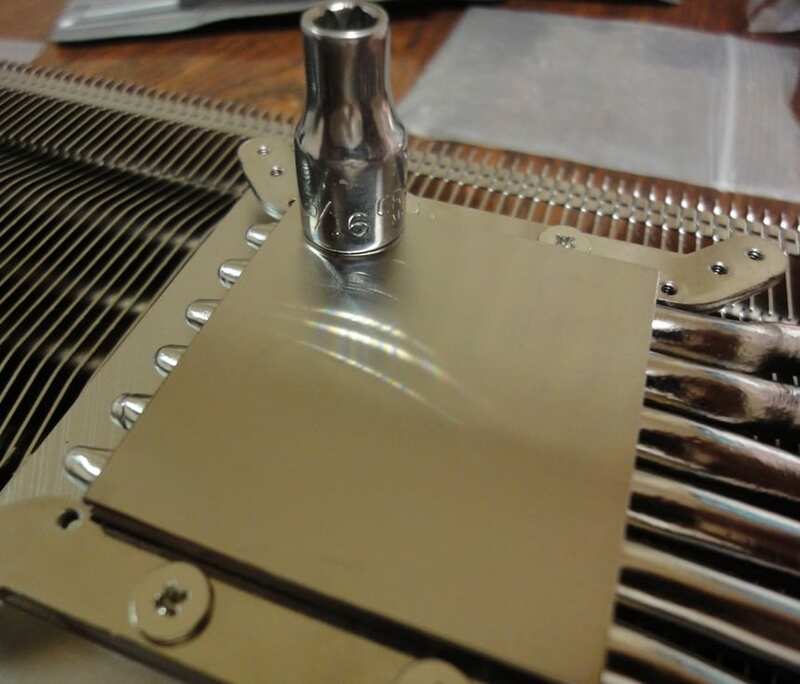 According to the instructions, all of the memory chips on the card should have one large heatsink affixed, but the last memory IC on the left did not have enough clearance under the heat-pipes of the cooler. 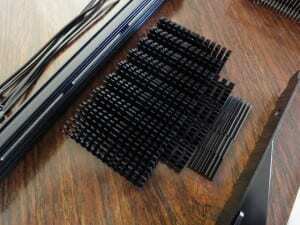 I had to use one of the smaller VRM type heat-sinks instead. 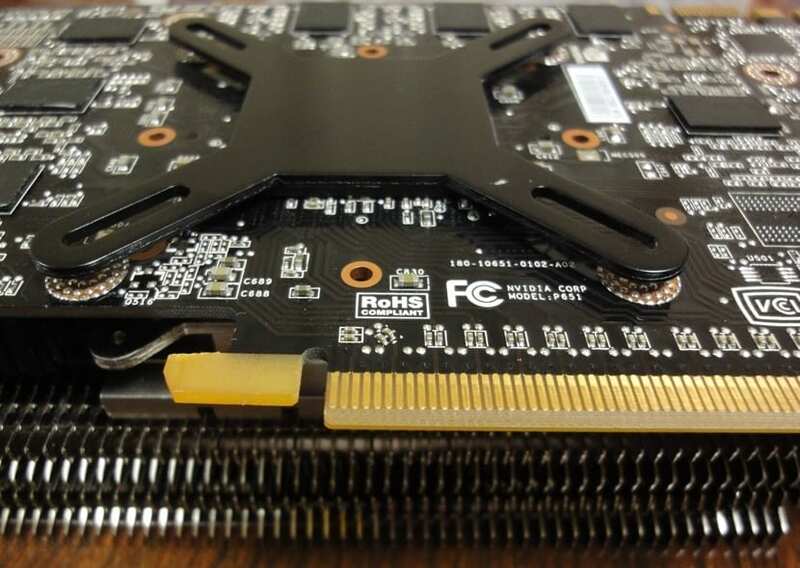 If you would also like to apply heatsinks to the memory ICs on the back side of the card, there are enough included for the GTX 260, but they are large. Be prepared and ensure your system has proper clearance. 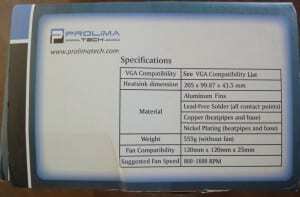 Also, Prolimatech did not bundle a heatsink specific for the GTX 260 PLX chip. 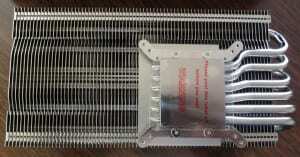 It generates a lot of heat, and has holes nearby which could be used to securely attach a generously sized heatsink, some of the competition provide such a heatsink. 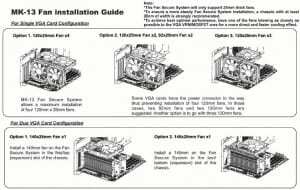 Since there isn’t one included, I was stuck using one of the smaller heatsinks intended for VRM cooling. 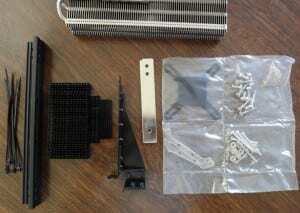 Which leads me to my last nitpick, the smaller VRM heat-sinks were not small enough. There are quite a few surface mounted capacitors and resistors in the area around the VRM area that are taller than the VRMs, and they will prevent proper contact with the over sized heat-sinks provided. 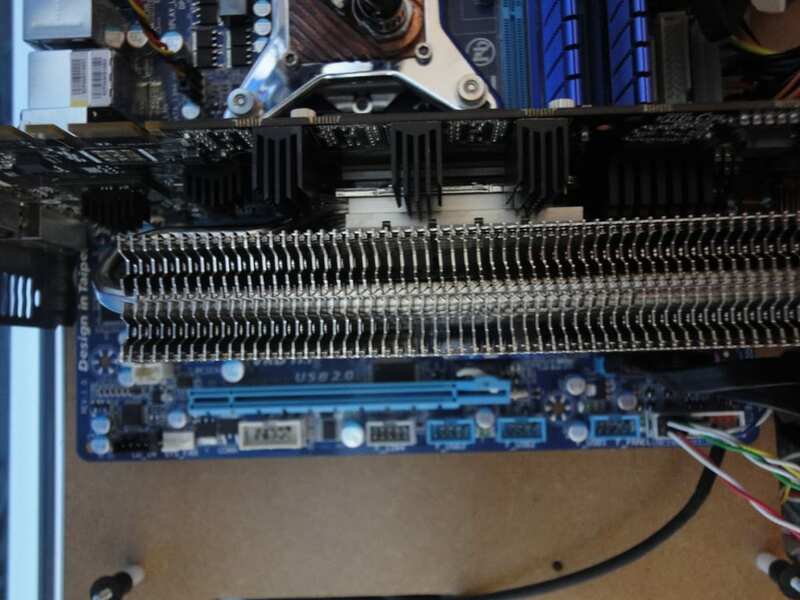 So I had to substitute some smaller copper heat-sinks that I already owned. 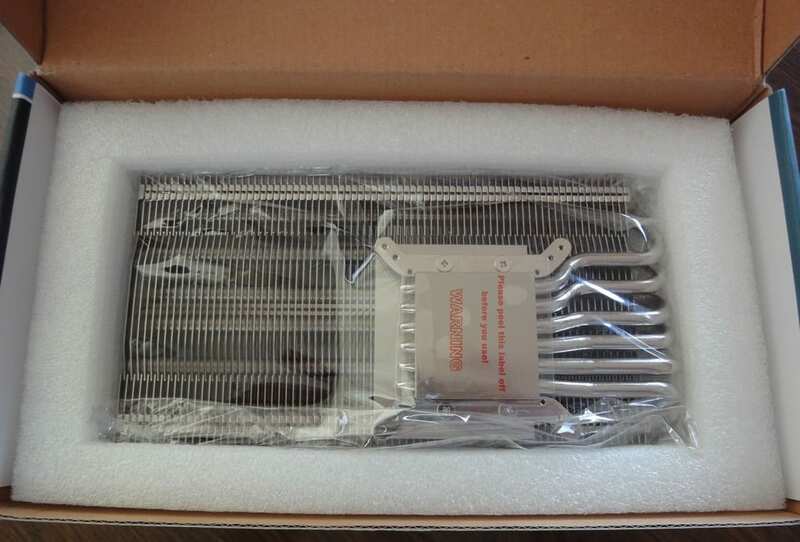 If I had not had these extras, I would have been unable to proceed because the VRMs require heat-sinks to cope with the heat they generate. 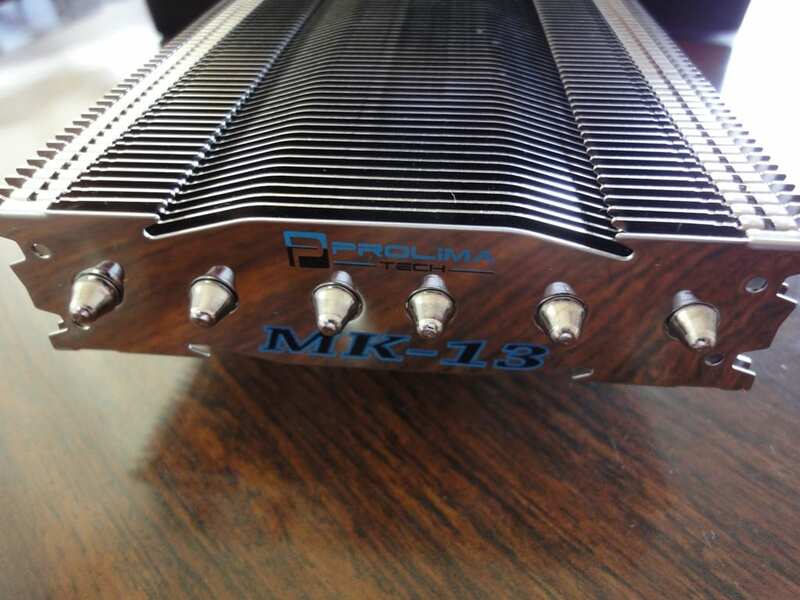 Moving on to the more positive aspect of installation, the MK-13 heatsink itself. 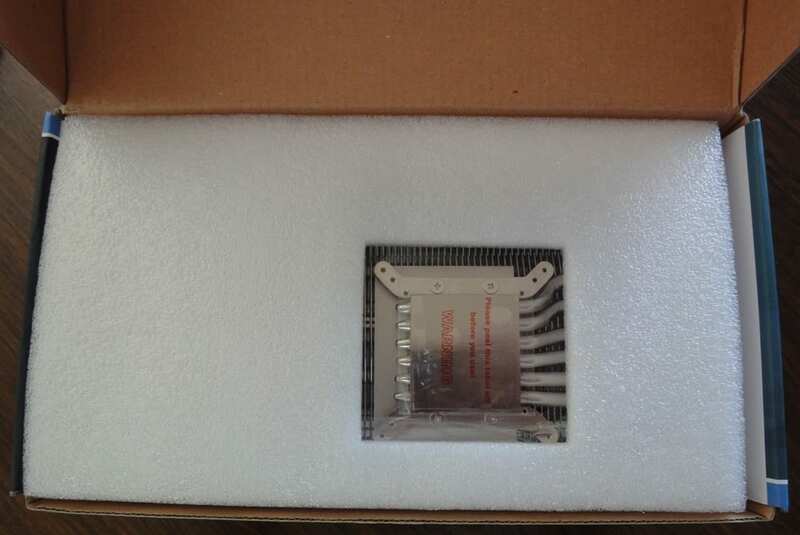 The cooler is quite large and mounting it to the card was fairly straightforward, thanks to a very simple mounting system. 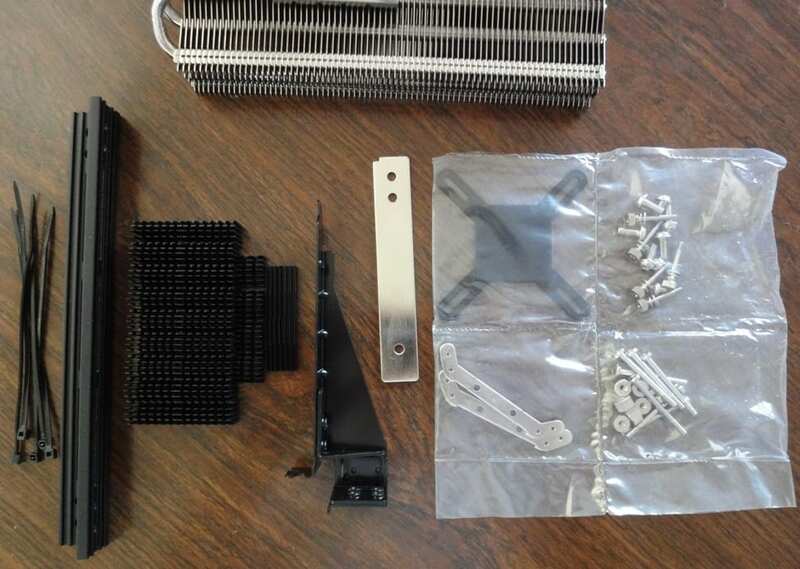 The cooler came with two sets of brackets that screw into the bottom of the heat-sink. One set was already installed (I’m guessing its the set with the more common mounting hole patterns), and matched up with my 260 GTX. Here is a shot of the contact surface, as you can see the surface is relatively smooth, but far from a mirror finish. After cleaning off the card, I applied some of the Prolimatech PK-1 thermal compound that was included in the package. Then I placed the heatsink on my work surface upside-down, and lined up the holes. I placed the card down ensuring the holes were lined up, then I placed the included back-plate on the card with the rubber side toward the PCB. The last step was to use four long thumbscrews, one at each corner of the mounting system, they screwed in from the back-side, through the back-plate and PCB, and into the brackets mounted on the bottom of the heat-sink. I hand tightened the four screws and that completed the installation. After getting the heat-sink mounted, I needed to get the card installed onto my testbed, but here I ran into a couple more issues. 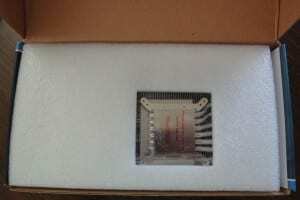 First off, as you can see in the pictures above, the thumbscrews protrude off the back of the card….A LOT! 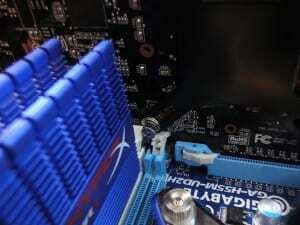 On my GA-H55M-UD2H test motherboard, one of the screws interfered with one of the memory slot retention clips. See the pictures below for detail. While this was not a problem for my testing, any user who would like to use all four memory slots with this configuration would have problems. 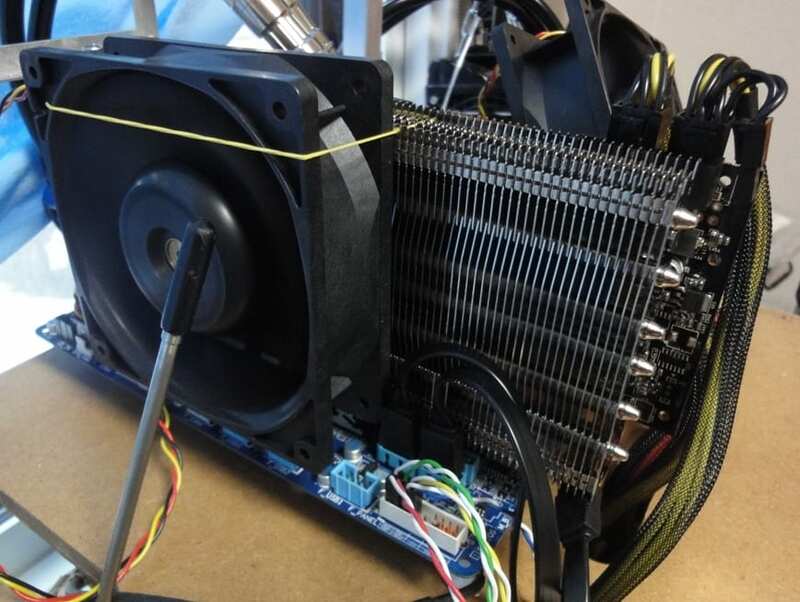 The second issue is the immense size of the cooler itself, even without a fan mounted, this is a three slot cooling solution, with my 38mm wide test fan, it became a 5-6 slot solution! One more very important piece of the package is Prolimatech’s fan mounting system, capable of supporting up to four (yes four!) 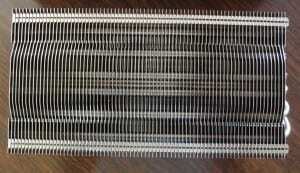 120x25mm fans! 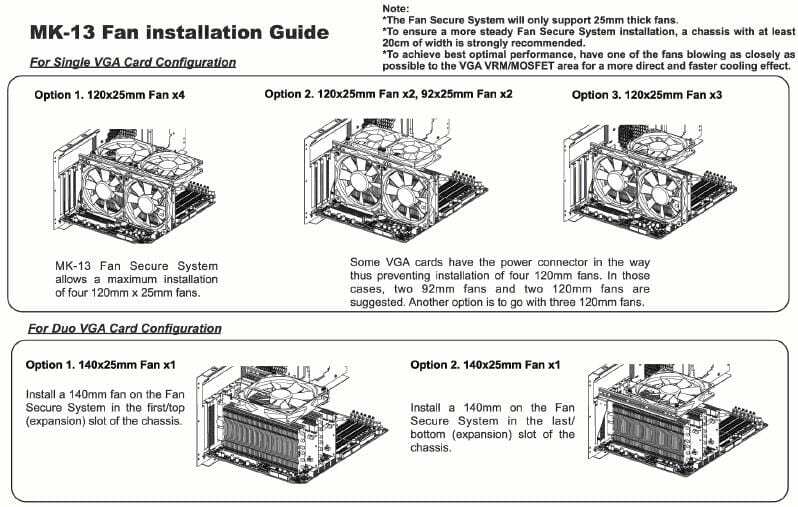 At first glance I though this would be a horrible way to mount fans, the long beam connected only to the rear expansion slot area surely does not have the strength to support four fans right? Actually, just like everything else we’ve seen from this company, the parts are exceptionally strong, and the package includes extra reinforcement that screws in from the outside of the case. For most users with steel cases, this mounting solution will be more than adequate. For those of you with thin aluminum cases, it may still be a bit wobbly even with the extra brace. Unfortunately, I was unable to do more testing with my setup. The good news is that this brace offers a multitude of options and I know users will love it for it’s flexibility. Here is a snip from the owners manual showing some of the possibilities. 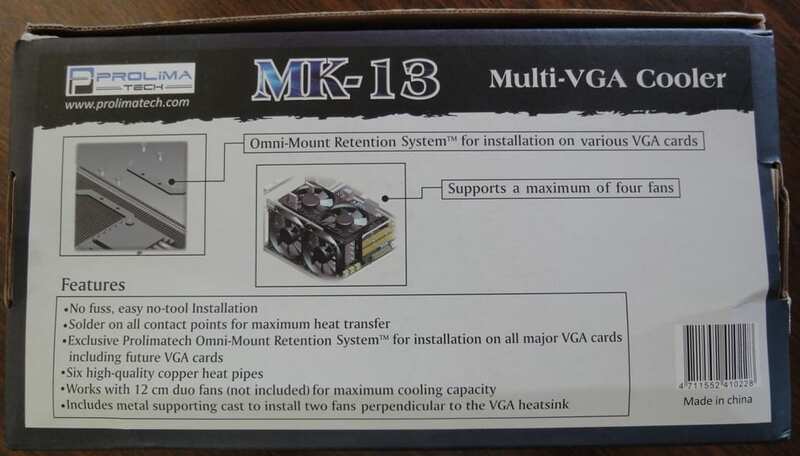 For instance, if I wanted to run two of these 260 GTX video cards in SLI (and I had a motherboard with the proper slot layout), I could install this fan mount above the two cards, and have two 120x25mm fans blowing over the full length of both cards. 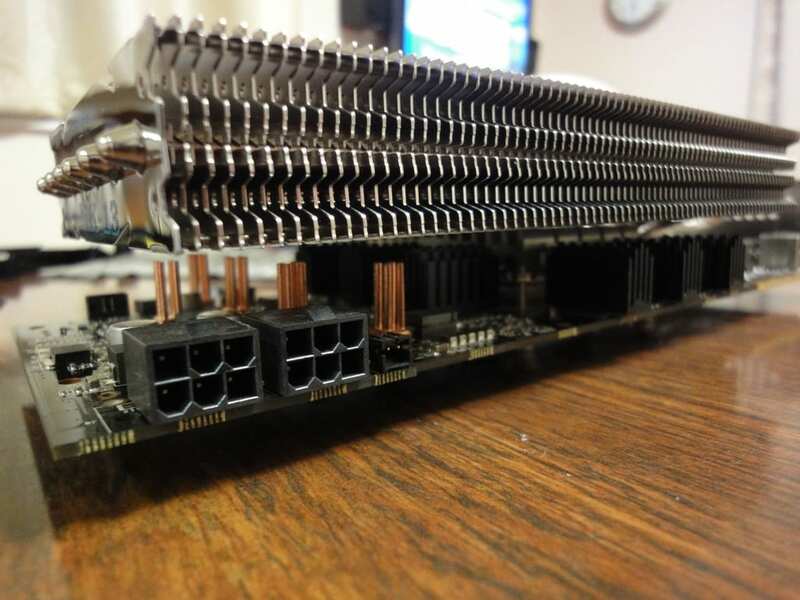 If the fans were nice and quiet, it would make for a very quiet, very powerful graphics solution! 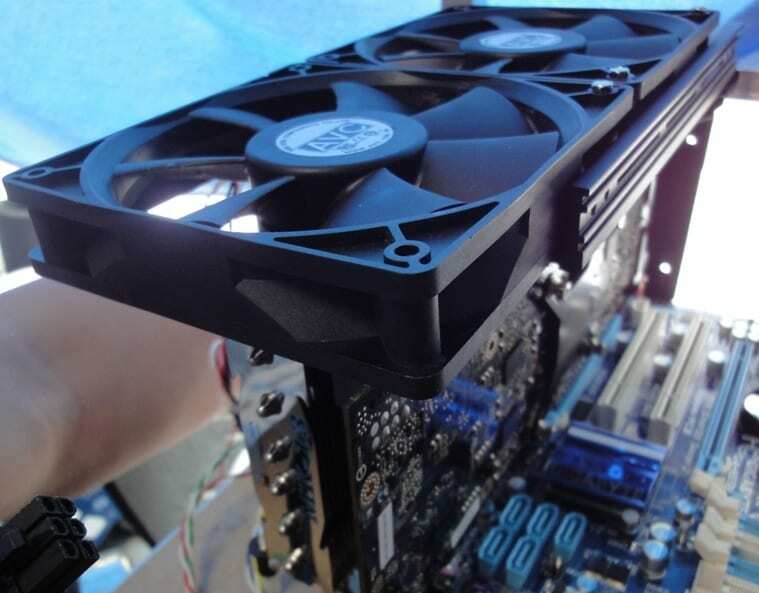 Mounting the fans is quick and easy, and they are surprisingly secure, even if only attached with a single screw. 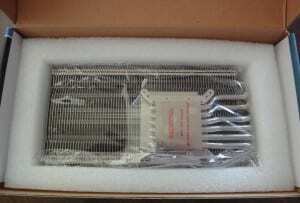 I’ll be doing all testing on an open testbed (not in a case). 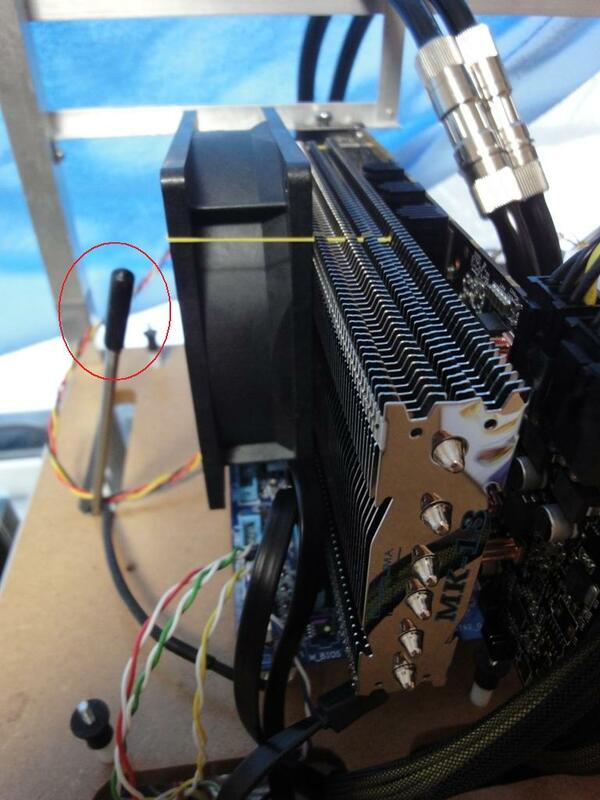 I’ll be using a high precision digital thermometer placed right in front of the cooling fan used, and monitoring the ambient temperature of the air being drawn in to cool the video card. That will allow me to provide two data points, GPU temperature, and rise over ambient or “RoA”. 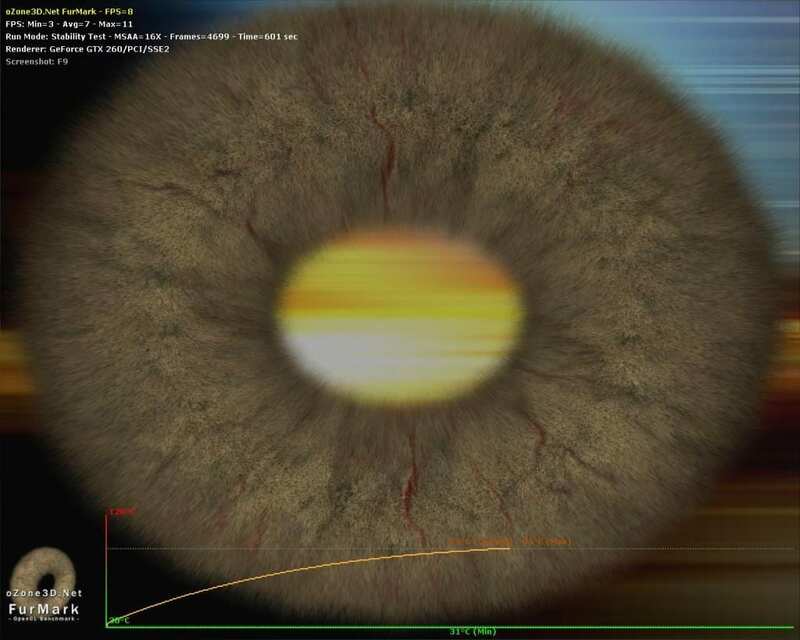 That is the GPU temperature minus the ambient temperature. My goal was to verify performance for two typical scenarios. First, for the user who wants a high power graphics solution, while maintaining low noise levels. 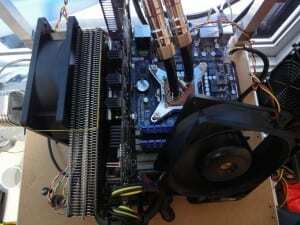 The second configuration attempts to mimic the overclocker who is looking for maximum performance. 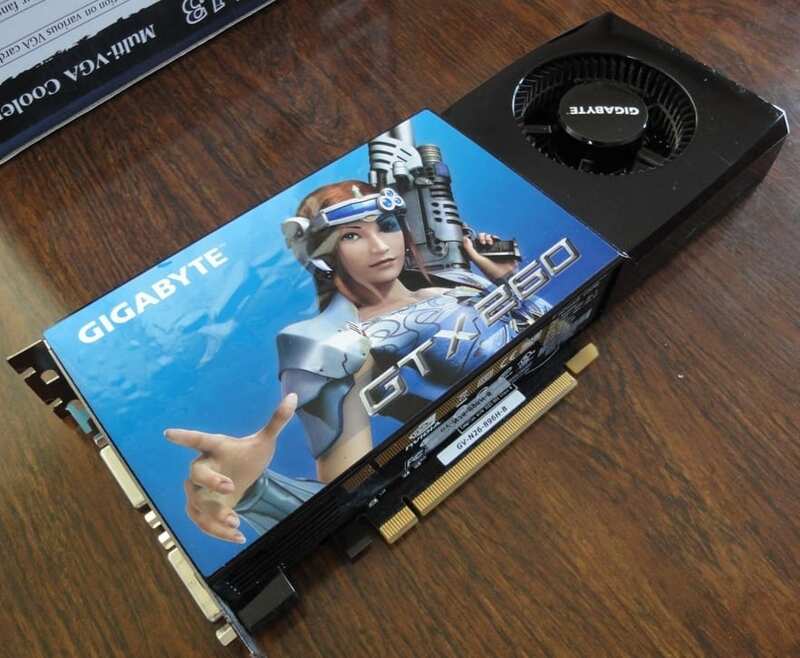 It’s no secret that the stock heat-sink/fan combination of most high powered graphics cards produce a significant amount of noise, maintaining high performance while reducing the noise levels has taken a large priority for many users. So for my first round of testing, I used the video card in completely stock configuration. I compared this to the card with the MK-13 mounted, and running completely passive to see if this cooler has what it takes to be silent. The second group I’ll mimic in my testing is the performance enthusiast looking for performance regardless of noise penalty. 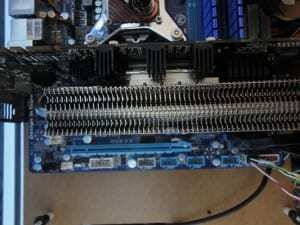 In this test, I’ll crank up the GTX 260’s core voltage to 1.3V and run the stock fan at 100%. 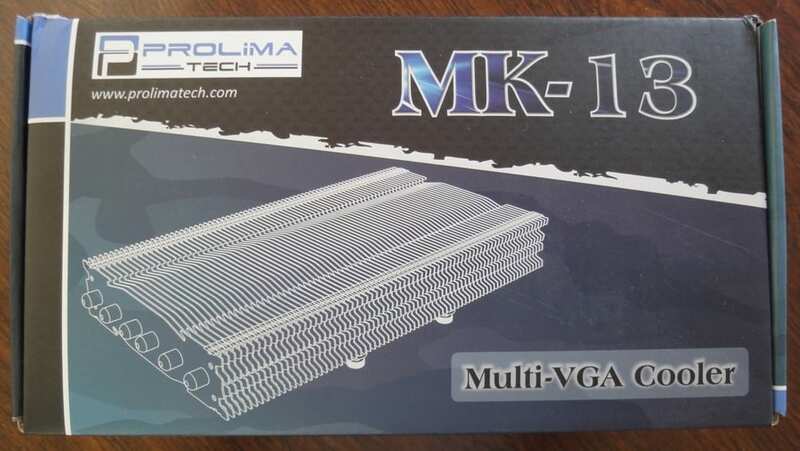 The Prolimatech MK-13 cooler will also have to cool the GTX 260 with 1.3V, with the help of a single 2600RPM San Ace 120x38mm fan rated for over 110CFM. For all tests, I’ll be pushing the card to extreme loads with the FurMark “Extreme Burning” stability test + x16 MSAA. I’ll let the test run and record the maximum temperature for 10 minutes. During the course of each 10 minute run, I’ve also recorded the ambient temperature of the air being drawn into the cooling fan (with the exception of the passive cooling test). 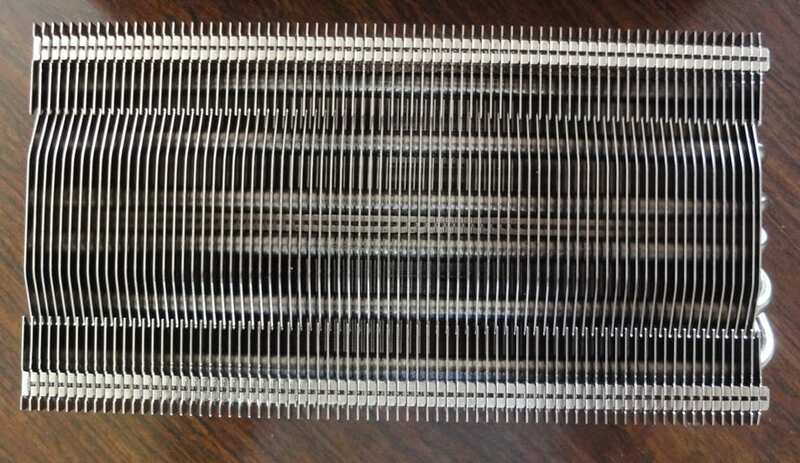 As you can see here, the stock heat-sink heats up quickly, but then maintains reasonable temperatures during the test. This is due to a low initial fan speed, but as heat increases, the stock fan quickly speeds up to keep the card cool, the maximum recorded temperature after 10 minutes was 75°C. Looking at the MK-13 in passive mode, we can see that with zero direct airflow, the cooler is able to keep the GPU under 90°C for the full ten minutes, but only just. 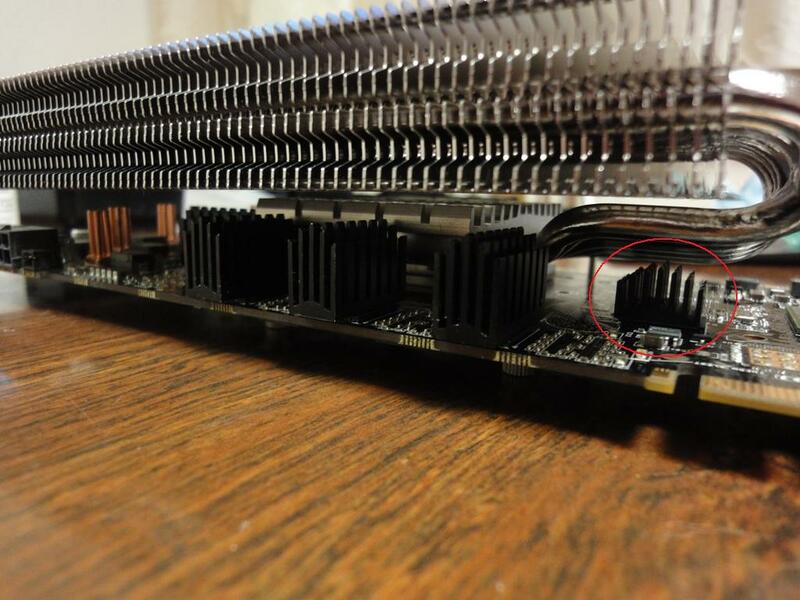 You can see in the screenshot that the temperature was still rising, and given enough time, the card would likely overheat and/or throttle it’s performance to prevent damage. It seemed to me that the cooler was very close to being able to cope with the heat load created in this test, so I decided to allow the test to continue to run, but to add a very low airflow fan above the heat-sink, 15CFM to be precise. 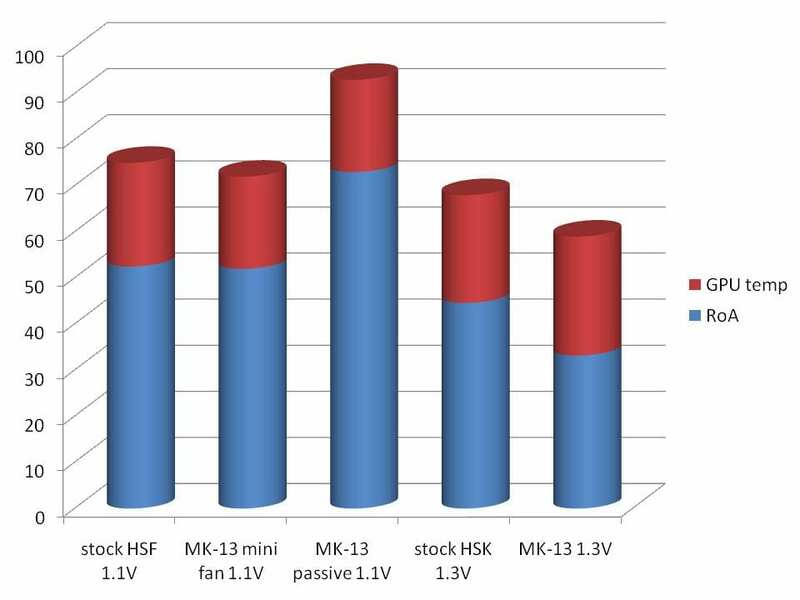 Many enthusiast cases have side panel fans these days, and those side panel fans usually create much more airflow than this configuration. I think it represents the possibilities of this card and cooler mounted in a case with a reasonable amount of airflow. 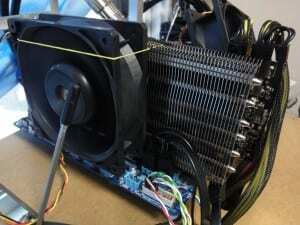 About 11 minutes after the test began, the small fan whirs to life. Immediately the temperatures begin to fall. After a total of 20 minutes, temperatures have dropped to the mid-70°C range, very impressive in my opinion. This also beats the performance of the stock cooler, and this fan is nearly silent. The second round of testing was intended to mimic performance minded enthusiast attempting to extract all of the performance possible from the graphics card, noise is not a concern. 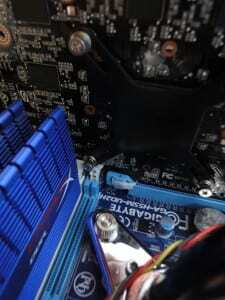 Therefore, the stock fan is cranked up to 100% and let out a wail! But even pumping 1.3V to the GPU core, the stock heat-sink impressed by keeping the GPU at a maximum temp of 68°C after ten minutes of stress from FurMark. Strapping a big powerful fan to the MK-13 also proved very impressive, keeping the GPU at 59°C maximum over the ten minute test. That’s a solid 9°C improvement over the stock heatsink, and (subjectively) much quieter while doing so. Here is all the test data condensed for easy review. In these graphs, you’ll see both the overall GPU temperatures in blue, and the RoA temperatures in red. So, I come away from this review with mixed feelings. 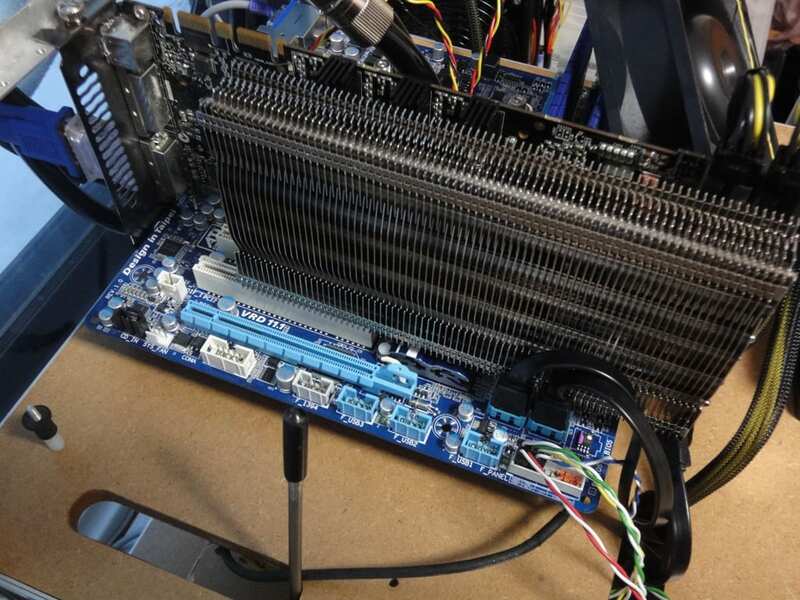 A few issues with the bundled memory/VRM heatsinks, interference between the cooler and the motherboard, and the sheer size of the cooler all dampen my enthusiasm. But nothing can take away from the impressive performance this cooler provides. I started out with two typical users in mind. One strives for high-end components that run cool and quiet. The second desires maximum performance despite the cost. For the silent computer enthusiasts out there, take note. 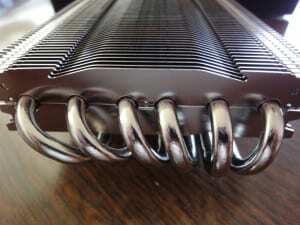 A single side fan blowing over this heatsink should give you plenty of cooling power while being substantially quieter than the stock configuration. In my opinion, this could prove a serious boon to users running in SLI or crossfire mode, if you have the space necessary. 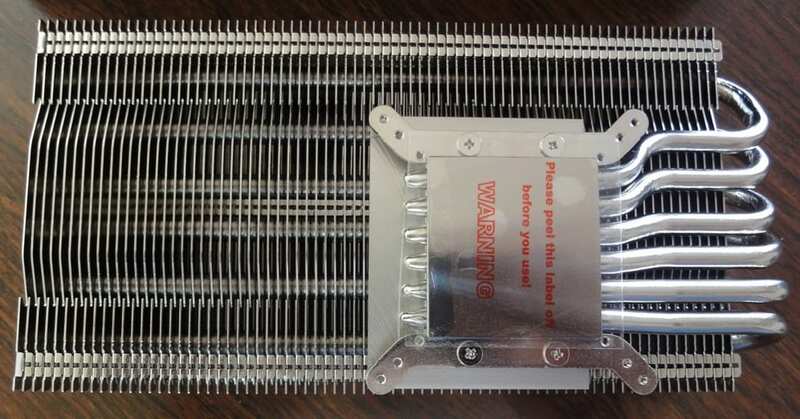 For the performance enthusiast looking for maximum overclock, this heatsink will give you serious cooling power, I’d be willing to bet this is one of the top performing air coolers on the market (hopefully I’ll be able to substantiate that claim soon). 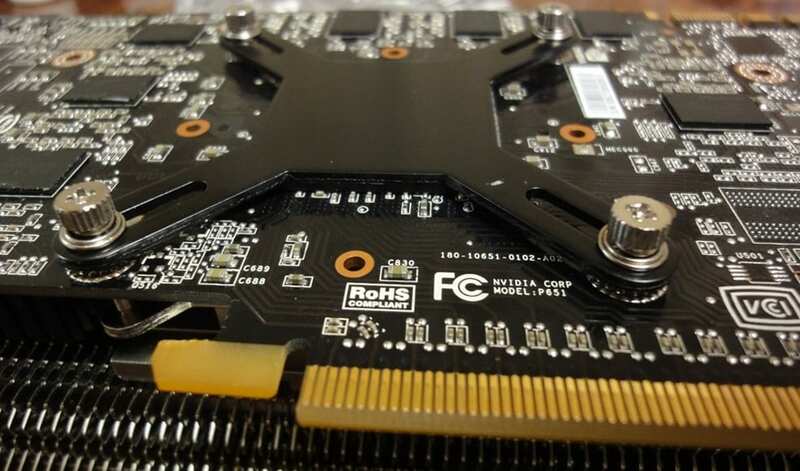 Unless you want to get serious with water cooling, or even more exotic with extreme cooling, this will be a solid choice to extract the hidden performance from your graphics cards. 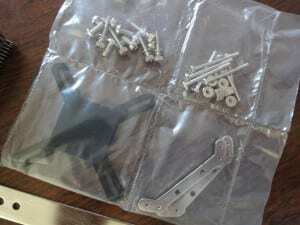 A big “Thank you!” to Prolimatech for the review sample! Keep up the good work Prolimatech, we anxiously await whatever is next! Great Review there MIAHALLEN, very nice looking cooler too, and seems to get the job done well with the ease of various Fan configurations.